Whisky Auctioneer is selling a rare bottle of Bowmore 1966 Samaroli Bouqueta, which is expected to fetch between £25,000 and £30,000 at auction. 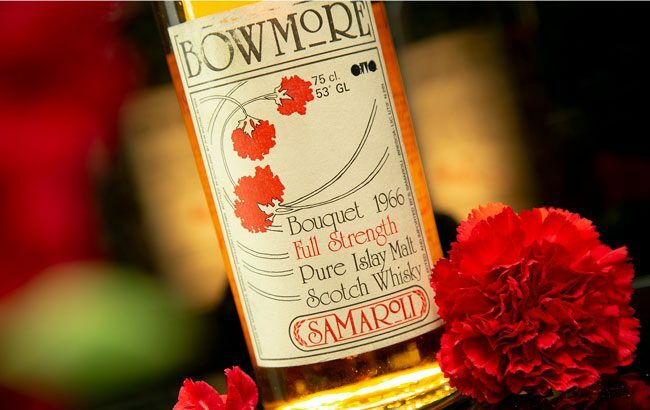 Just 720 bottles of the Bowmore 1966 Samaroli Bouquet were produced. The whisky was distilled by the Islay distillery in 1966 and bottled in 1984 by renowned Italian bottler, the late Silvano Samaroli. Sean McGlone, director at Whisky Auctioneer, said: “The Bouquet series enjoys a legendary status and reputation within the world of whisky, and rightly so. Not only is the liquid itself exceptional but the artwork on the bottle is exquisite. The Bouquet was distilled in 1966 and was bottled by Samaroli, an Italian independent bottler, famed for his artistic, innovative labels and packaging. The rare bottling is the latest expression from the Islay distillery to be sold through the auction site, which previously sold a rare 30-year-old bottle of second edition Black Bowmore single malt whisky for £11,900. The Perth-based auctioneer has also sold the world’s largest known collection of Karuizawa whisky from Japan for £770,000. The auction for the Bowmore 1966 Samaroli Bouquet will go live on 22 June and will close on 2 July.